Jesus said to him, "Thomas, because you have seen Me, you have believed. Blessed are those who have not seen and yet have believed." Some people say they cannot have faith because they are practical. They need to know something is true before they can believe it. But we all apply faith every day. When you go to a restaurant, order a meal, and eat what they bring, that is faith. You are not sure if they followed all the sanitary guidelines they are supposed to follow. You don't know whether the waiter might be a little ticked off at you and has thrown a few little surprises into your entree. You don't know. So you apply faith. When you go down to the pharmacy to fill your prescription, you assume the little pills the pharmacist gave you are actually the ones you ordered and not a placebo, or even worse, another kind of medication that could be harmful to you. You apply faith. When you have surgery and are put under anesthesia, you must put complete faith in the anesthesiologist, surgeons, and nurses. Or how about when you board a plane and taxi down the runway in that 747? Do you understand aerodynamics? Most of us wouldn't. Yet we believe those pilots in the cockpit are hopefully not drunk or distracted. We hope they will get us safely to our destination. My point is this: we apply faith each and every day. Faith is belief plus action. It is what we apply when we initially come to Jesus Christ. We acted on something that we accepted as true. The Bible says, "For by grace you have been saved through faith" (Ephesians 2:8). So when someone refuses to put their faith in God, it leaves me wondering. They can put faith in a waiter, in a pharmacist, in a surgeon, and in a pilot, but they won't put their faith in God Almighty. Copyright © 2010 by Harvest Ministries. All rights reserved. Scripture taken from the New King James Version. Copyright © 1982 by Thomas Nelson, Inc. Used by permission. All rights reserved. to listen to Greg Laurie's daily broadcast on OnePlace.com, click here. Hope for Hurting Hearts, Pastor Greg Laurie's new book, examines these truths, revealing God's love and care for us, and shows how we can find hope, even in the midst of the most unbearable pain and sorrow. 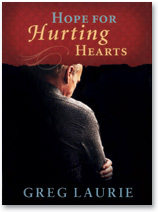 You can have your own copy of Hope for Hurting Hearts by Greg Laurie in appreciation for your gift to Harvest Ministries this month.